Carnegie Mellon University is celebrating 30 years of self-driving car technology. And at CMU's Pittsburgh campus, the birthplace of autonomous vehicle (AV) technology, self-driving cars are revving up to revolutionize transportation worldwide in the next decade. "The evolution of AV technology at Carnegie Mellon is a remarkable success story that epitomizes how innovation advances when engineers, roboticists and computer scientists collaborate," said Farnam Jahanian, CMU's vice president for research. To date, CMU has created more than 140 technologies related to autonomous vehicles. CMU's latest self-driving vehicle, a 2011 Cadillac SRX, takes ramps, merges onto highways and cruises at 70 mph. Despite its sophisticated technology, the Cadillac looks like an everyday SRX model because its sensors are integrated into the vehicle's body. In June 2014, Congress members rode through Washington, D.C., in the Cadillac. Compare that to CMU's first autonomous vehicle, the Robotics Institute's Terregator, which in 1984 rolled along at the whopping speed of several centimeters per second. "At a time when thinking machines were the stuff of fiction, Terregator took autonomous driving from fantasy to fact. CMU had developed the underpinnings of autonomous driving and cast that into the world," said William L. "Red" Whittaker, the Fredkin Professor of Robotics at Carnegie Mellon's School of Computer Science. As self-driving technologies have matured, they are gradually being assimilated into auto production. Adaptive cruise control and parking assist are commercially available now. In the 2020s, cars will have traffic jam assistance and virtual valet, a feature that enables cars to park themselves via a smartphone app. "Features of automated self-driving cars will appear incrementally and organically, with vehicles eventually driving themselves. This will make the cars affordable and encourage public adoption," said Raj Rajkumar, a professor of electrical and computer engineering and the co-director of the GM Collaborative Research Lab at Carnegie Mellon. Rajkumar holds a courtesy appointment in the Robotics Institute, where many of the technologies originated. 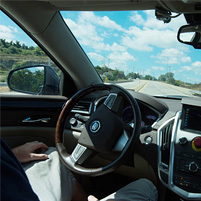 "In the not-so-distant future self-driving cars will provide society with many benefits pertaining to safety and quality of life," said Rajkumar, who also directs the Center for Technologies for Safe and Efficient Transportation (T-SET), one of five U.S. Department of Transportation National University Transportation Centers. To help ensure that self-driving cars become reliable, CMU is working to accurately analyze the data that sensors collect about driving environments. Algorithms process this information, which is used to control the vehicle, so it is imperative that environmental data is interpreted correctly. "Through its desire and capacity for interdisciplinary research, the Carnegie Mellon College of Engineering is well positioned to address these challenges. By working on complex real-world problems, we provide students with exciting and meaningful educational and research experiences," said James H. Garrett, the dean of the College of Engineering. A number of engineers who work on autonomous vehicle technology for automakers, Google and other universities began at Carnegie Mellon. Beginning in 1984, CMU's Robotics Institute ran the NavLab project, which yielded 11 generations of semi- and fully-autonomous vehicles. From 2004 to 2007, teams organized by William "Red" Whittaker, professor of robotics, were top contenders in the Defense Advanced Research Projects Agency (DARPA) Grand Challenges. CMU won the 2007 "DARPA Urban Challenge" with Boss, a Chevy Tahoe that traveled a 55-mile course autonomously. The Terregator's top speed was a few centimeters per second; it could avoid obstacles. NavLab launched. Its goal: apply computer vision, sensors and high-speed processors to create vehicles that drive themselves. Humans or computers controlled NavLab 1, a Chevy van. Top speed: 20 mph. NavLab 2, a U.S. Army HMMWV, wrangled rough terrain at 6 mph. Highway speed: 70 mph. NavLab 5, a Pontiac Trans Sport, traveled from Pittsburgh to San Diego in the "No Hands Across America Tour." NavLab 11, a Jeep, was equipped with Virtual Valet. Sandstorm and H1ghlander placed second and third in the DARPA Grand Challenge. Carnegie Mellon's "Boss" won the DARPA Grand Urban Challenge by outmaneuvering other vehicles along the 55-mile course. Carnegie Mellon's latest self-driving vehicle is a Cadillac SRX that avoids pedestrians and cyclists, takes ramps and merges, recognizes and obeys traffic lights and looks like other Cadillac SRXs.